Premium high-end audio manufacturers like Meridian Audio have shifted focus in recent years to the world of luxury high-performance automobiles and yachts. Consumers with the financial means to spend more than $80,000 on a car have proven to be unfazed by expensive options such as navigation, communication, and entertainment packages that often add an additional $4000 to the final sticker price of an automobile. The results so far for Meridian, with its partners at McLaren, Jaguar, and Land Rover, have been quite rewarding. 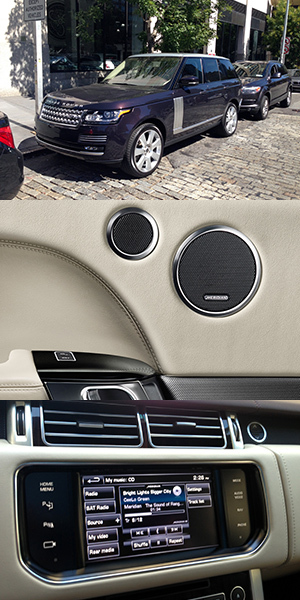 Land Rover’s entry-level 2014 Range Rover starts at $83,545 in the United States and includes a 12-channel Meridian audio system with 13 drivers and 380W of power. Meridian has recently launched the Signature Trifield-3D Reference system, however, which comes standard on the brand-new Range Rover Autobiography, which is now available for $140,000. With a little help from our friends at Meridian, and the generosity of the Classic Car Club in New York City, we were given the opportunity to take the 2014 Range Rover Autobiography for an extended test drive and to have a listen to Meridian’s most innovative automotive stereo system so far. The Autobiography may look like Range Rover’s HSE model, but this supercharged 5.0-liter V8 SUV comes standard with 510 horsepower and rockets from 0-60mph in 5.1 seconds; this becomes even more impressive when you realize that it weighs more than 5000 pounds. With a top speed of over 155mph, it’s rather obvious why the Autobiography is selling rather well in Asia, Europe, and the Gulf states to wealthy customers who desire performance and the ultimate in luxury interiors. The cabin of the Range Rover is incredibly well-insulated from outside noise. The Signature Trifield-3D Reference system offers 1700W of power, and 29 loudspeakers, including a 10” subwoofer, and front height loudspeakers that are positioned above the driver's and front passenger’s heads. The system also includes support for Bluetooth, a ten-disc memory vault, and the option to connect an USB memory stick. Meridian utilizes active DSP-based crossovers, cabin-correction software, and digital dither shaping, which also includes 24-bit/96kHz DACs, to reproduce a three-dimensional-sounding soundstage within the confines of the cabin regardless of where the passenger is seated.